FUEL will be screened opening night at the Santa Fe Film Festival! 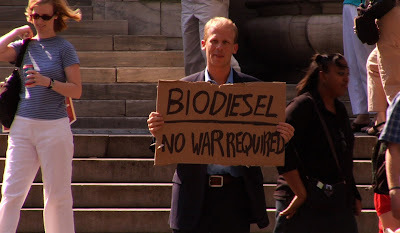 FUEL is a feature environmental documentrary that follows Director, Josh Tickell, as he unravels America's addiction to oil- from its historical origins to the political constructs that support it, to the alternatives that are available now and the steps we can take to change. 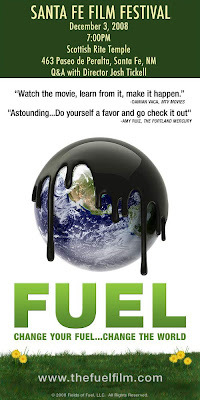 FUEL won the Audience Award for Best Documentary at last year's Sundance Film Festival and has been hailed by audiences and critics as one of the most important films of our time. It was also recently shortlisted for the Academy Awards which means it is one of 15 documentaries still in the running for nomination. The screening will be held December 3, 2008 at 7:00PM at the Scottish Rite Temple, Santa Fe. Director, Josh Tickell, and Producer, Rebecca Harrell, will be attending and holding a Q&A Session after the screening.